In 1866, a friar by the name of the Father Paulino became the curate of the town. He put up “quita” or chapel, preached God’s words and baptized the people. He put semblance of government by appointing Fructuoso Gannaban as Gobernadorcillo. Sparse settlements are found along the CagayanRiver and these barrios were Turayong, Labinab, Duminit, Baringin and Culalabat, believed to be the first barrios of Cauayan. Father Miguel Bonnet replaced Fr. Paulino who left for Manila. He proved to be a good missionary of God and leader. It was during his leadership that a big adobe and stone church was constructed. As the years passed, the town became well-known for its tobacco industry luring other inhabitants from as far as Ilocos and Pangasinan to work on vast tobacco farmlands of the Tabacalera’s Hacienda de San Luis. The city has recorded a total population of 125,148 as of 2010. Its total land area is 336.40 km2 (129.88 sq mi) divided among its 65 component barangays. Cauayan City is about 375 kilometers northeast of Manila; 34.5 km. 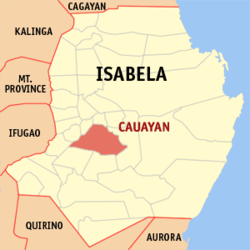 south of Ilagan, the capital town of Isabela; about 48 km. North of Santiago City; and roughly 117 km. away from Tuguegarao City in Cagayan province. Gaddang is the native language spoken by majorityof the original settlers, especially in some part of the city’s forest, eastern and western regions. Ilocano dialect with a mixture of Tagalog, Ybanag and English are being spoken in the poblacion areas. English and Tagalog are the languages used in schools and business offices. Cauayan is classified as a 1st class city as of 2010. It is the location of 29 banks, 21 lending institutions, 44 insurance agencies, 89 real estate businesses and 35 pawnshops. There are over 4,442 commercial establishments that include distributors, wholesalers and retailers. Cosmos Bottling Corporation, now acquired by the giant multinational business conglomerate San Miguel Corporation manufactures soft drinks in the area while the Mega Asia Bottling Corp. will soon inaugurate its newly built plant giving a greater niche for the RC Cola brand. It is also here where the regional sales offices of several multi-national companies are located. The city has enormous potential for small to large enterprises. With roads leading to all the towns of the province, it is a good location for a regional or provincial headquarter. As a young city, its real estate industry is just beginning. Medium size commercial centers or subdivisions are the appropriate ventures to put up. There is a need to establish a world-class resort and golf course to attract high-flying investors and the moneyed people of Cagayan Valley. Courageous entreprenuers may explore the posibility of technology-related businesses.